We have four contests and five winners total to announce today! Some of these are the firsts of the Holiday 2010 giveaways we will be hosting this fall. Out of 1875 entries, the winner of the Constructive Playthings 2pc Classic Wooden Kitchen Set contest is . . .
Out of 1028 entries, the winner of the Guidecraft Natural Wood Doll Cradle and High Chair contest is . . .
Out of 648 entries, the two winners of the O-Cedar ProMist Floor System contest are . . .
Out of 331 entries, the winner of the Slix Closer Boxer Brief contest is . 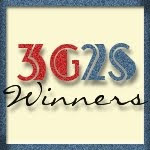 . .
Congratulations to all our winners! I will be sending out official email notifications right away. Please respond within 48 hours to claim your prizes. Remember that I always respond to confirm that I have received your information.